On Sunday 12th June, the National Water Sports Centre at Holme Pierre Point was home to the British Rowing Masters Championship. Loughborough Boat Club ladies, Erica Gummery, Zoe Hudson, Annie Beaumont & Cathy Beaumont arrived ready to take on the 1000m course. 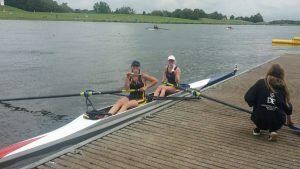 First to race were Erica and Zoe in their Masters B coxless pair. The ladies had a fantastic row and smashed their opposition from Avon County and Cambridge 99 and won Gold in a time of 4.22, which was 9 seconds ahead of the closest contender. Erica and Zoe were then joined by twins Cathy and Annie to race in the Masters A coxless four category against tough opposition from Kingston, Wallingford/Bristol, Derwent, Marlow and Norwich. The ladies were once again victorious and won gold in a time of 3.57. The ladies were awarded their gold medals by our very own President Don Wix MBE, great end to a great and successful days racing.